در این پژوهش زیست‌چینه‌نگاری سازند گورپی در برش کوه سفید مورد مطالعه قرار گرفته است. ستبرای سازند گورپی در این برش 5/190 متر است و به‌طور عمده شامل شیل،آهک‌رسی، آهک و مارن است. مرز زیرین آن با سازند ایلام همشیب و همراه با گسستگی سنگ‌شناسی و مرز بالایی آن با سازند پابده ناپیوسته و همراه با یک نبود رسوبی در حدفاصل مائستریشتین پسین- پالئوسن پسین است. 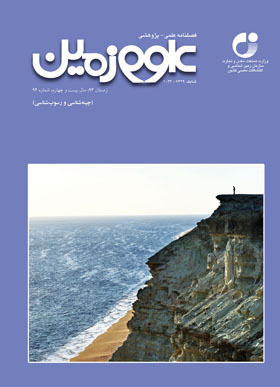 در این مطالعه 47 گونه متعلق به 17 جنس از روزن‌بران پلانکتونیک و 8 زون زیستی تشخیص داده شده است. این زیسـت‌زون‌هـا شامــل Dicarinella asymetrica, Globotruncanita elevata, Globotruncana ventricosa , Radotruncana calcarata, Globotruncanella havanensis, Globotruncana aegyptiaca, Gansserina gansseri, Racemiguembelina fructicosa است. با توجه به زون‌های زیستی یادشده سن سازند گورپی در این برش سانتونین پسین تا مائستریشتین پسین تعیین شده است. In this research, the biostratigraphy of the Gurpi Formation in Kuh-e-Sefid section in east of Ramhormoz is studied. The thickness of the Gurpi Formation is 190.5m and consists mainly of shale, argillaceous limestone and marl. The lower boundary with the Ilam Formation is comformable with sharp lithology and upper boundary with the Pabdeh Formation is unconformable with a gap between Late Maastrichtian and Late Paleocene. In this study, 47 species belonging to 17 genera and 8 biozones of planktonic foraminifera were recognized. The biozones consist of Dicarinella asymetrica zone, Globotruncanita elevate zone, Globotruncana ventricosa zone, Radotruncana calcarata zone, Globotruncanella havanensis zone, Globotruncana aegyptiaca zone, Gansserina gansseri zone, and Racemiguembelina fructicosa zone. The age of the Gurpi Formation based on these biozones is Late Santonian to Late Maastrichtian in this section.